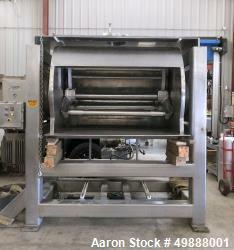 Used- Shaffer Roller Bar Dough Mixer, 2,000 Pound Capacity, Model 20 HS-SOFD, Stainless Steel. Bowl dimensions 56" wide x 42" x 40" deep. Driven by 125 hp sanitary open frame design motor. Hydraulic bowl tilt. Allen Bradley compack logis PLC, disconnect and starter panel. Serial# 0805555. 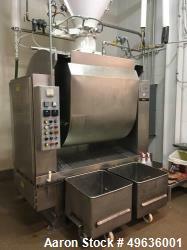 Used-Alto Corporation High Speed Dough Mixer, Model 1600. 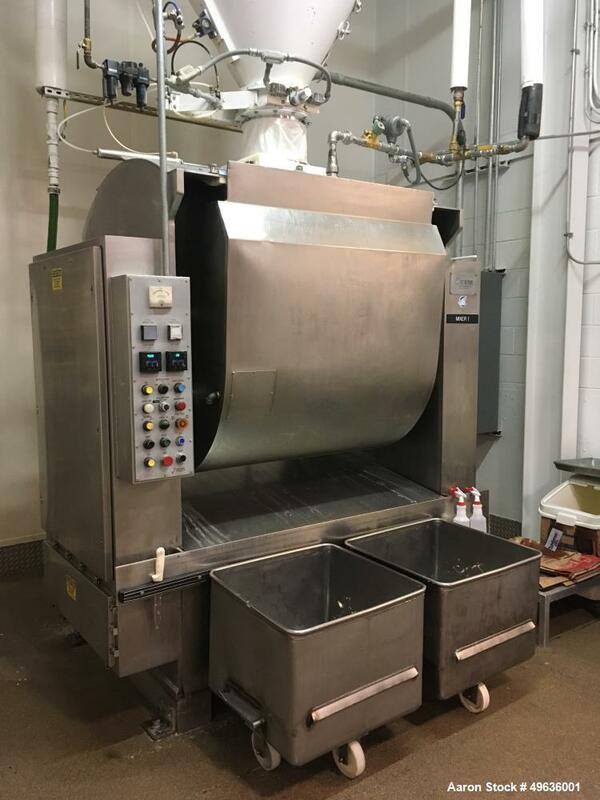 Used-Alto Corporation High Speed Dough Mixer, Model 1600. 3 Roller Bar Design, 1600 LB. Dough Capacity. Serial # 10828, Built 1980. MANUAL & DRAWINGS INCLUDED. Used-Shaffer Horizontal Bar Mixer, Model 10, 1000 LB Capacity Dough Mixer. Used- Peerless Roller Bar Mixer, Model RF1600HD. 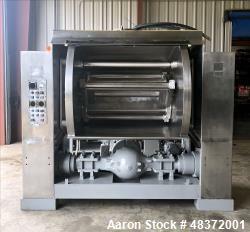 Used- Peerless Roller Bar Mixer, Model RF1600HD, 1,600 Pound Capacity. Jacketed bowl approximate 56" face x 48" high x 38" deep. Driven by 75 hp motor, 3/60/480 with controls, starter and disconnect. Gearbox specs: 1750 input rpm, ratio: 6:19, approximate 286 output rpm. Slide Door Design. Built 2004. 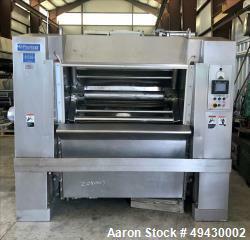 Used- Peerless Dough Mixer, (Bakery), Model 16HSFD. 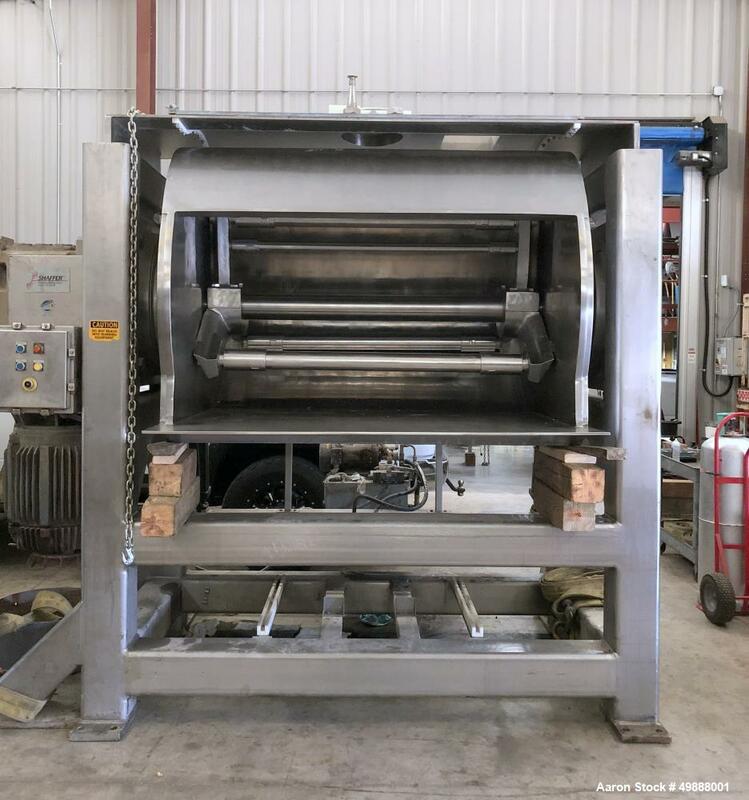 Used-Shaffer Horizontal Bar Mixer, Model 10, 1000 LB Capacity Dough Mixer. Stainless steel frame and Bowl. 75 /37.5 HP Motor, 1785892 rpm. Tilt bowl with separate drive. Bowl measures Approximately: 53" x 45" x 44". 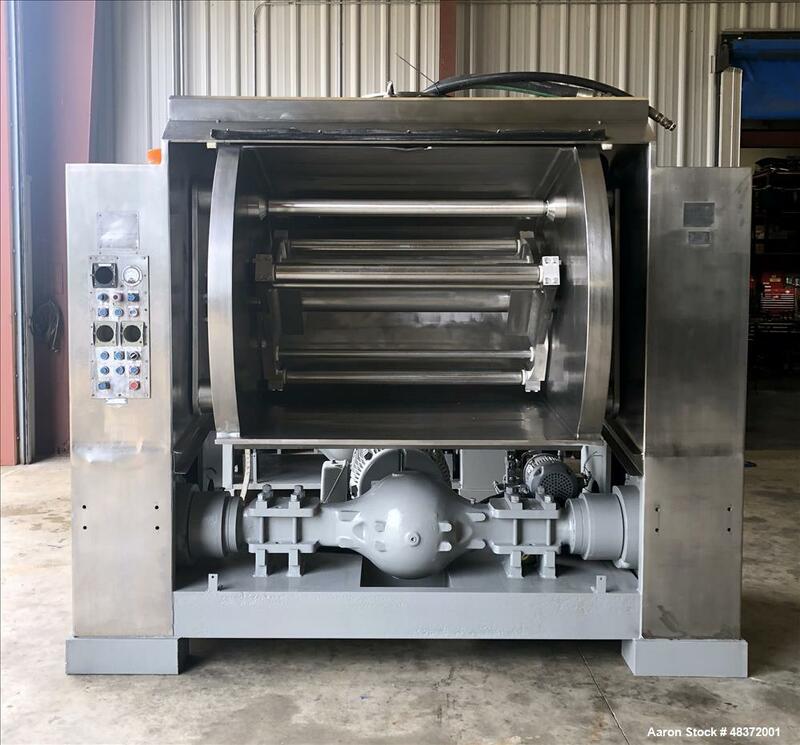 Starter Panel, 460V, 3 Ph, 60 Hz, Dual End Drive Belt Drive System, Stainless Steel Jacket on Bowl Sheet and Ends, Stainless Steel Roller Bar Split Hub Agitator and Main Shaft, Stainless Steel Cover, Liquid Inlets, 140 Degree Hydraulic Bowl Tilt with approximately 5 HP motor. Current disconnect and starter included. 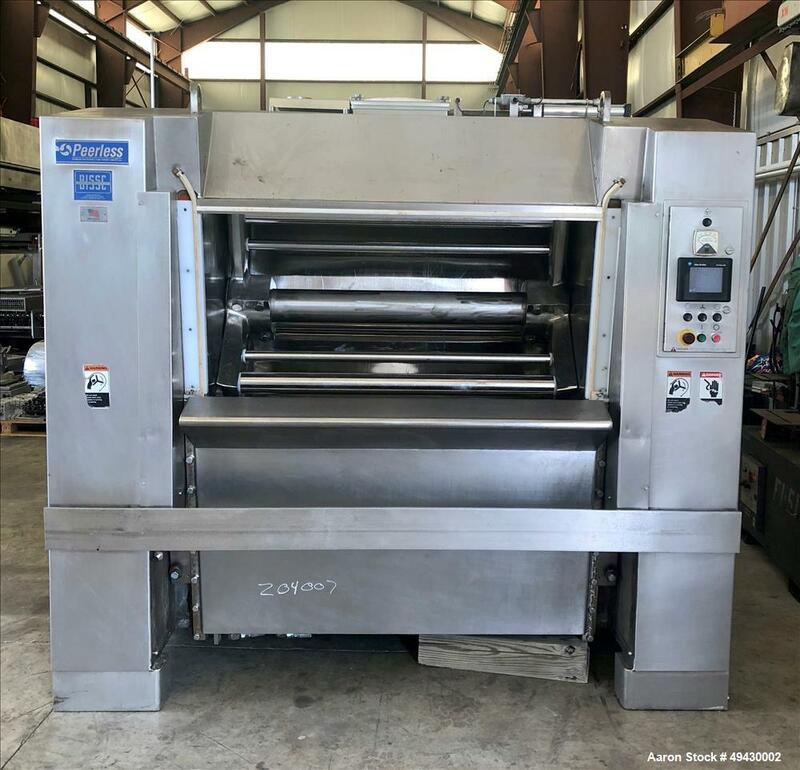 Used- Peerless Triple Rollerbar (High Speed) Dough Mixer, (Bakery), Model 16HSFD. 304 Stainless Steel. 1,600 Pound capacity, 47.6 cubic foot capacity. Bowl approximately 56" long x 48" wide x 50" deep. Driven by a 100/50 hp, 3/60/460 volt, 1760/860 rpm motor. No controls. Mounted on a carbon steel frame with stainless steel sheathing. Serial # 92072.